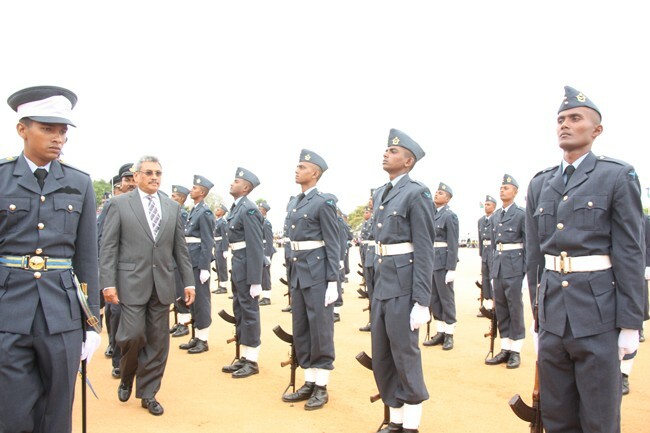 It gives me great pride to review the passing out parade of the 53rd Intake of the Sri Lanka Air Force. I congratulate all of you for an excellent parade, and for having completed your training at this prestigious Academy. From today, all 84 cadets and 386 other recruits will become members of one of the finest Air Forces in the world. I know that the training you have undergone is a very intensive and strenuous one, and I congratulate you for having completed it. I also take this opportunity to recognise the hard work of the Commandant and Training Staff of the Sri Lanka Air Force, in bringing these cadets and recruits to the standard they have achieved today. The proud parents of the young officers and recruits passing out today deserve particular congratulations. Your children are amongst the best of their generation, and you should be justly proud of what they have achieved. I must make special mention that the son of the former Air Force Commander and present Chief of Defence Staff, Roshan Goonatilleke, is one of the cadets passing out today. He is making history as a third generation officer, whose father and grandfather were both Air Force Commanders. This exemplifies the spirit of service and dedication that all of you have towards our nation. All the parents of the officers and other recruits deserve many thanks for allowing and encouraging their children to join the Armed Services. I am sure that they will make you more and more proud as they advance in their careers. I know that today is a very special day for all of the new officers and recruits who are passing out. I think it is appropriate at this time that you take a moment to reflect on the accomplishments of your predecessors at the Sri Lanka Air Force. During the period of the war, the personnel of the Air Force engaged one of the deadliest and most ruthless terrorist organisations in the world. Several brave officers and other ranks who graduated from this Academy before you sacrificed their lives to achieve peace for this nation. All those who participated in the war worked incredibly hard and underwent many hardships to achieve the defeat of terrorism. The environment today, as you graduate, is completely different. The country is at peace, and the demands that are made of servicemen are of a different nature. You have greater opportunity to concentrate on your training, and build up the skills and knowledge you require to further develop the professionalism and excellence of the Air Force. The challenge before you today is to become more efficient and more modern in your functioning. In the modern world, a modern military is a knowledge-based force. The application of science & technology and information technology has become an integral part of defence preparedness and the conduct of warfare. This means that we need well-educated and well-trained servicemen. It also means that our officers have to be even better educated and better trained. High quality training, good quality equipment and the ability to strategize are essential to the success of our Armed Forces. The environment in this country today lends itself to this, and you should take full advantage. It is also important to remember that you are joining an establishment that is youthful, well organised, and trained to carry weapons. You have a great responsibility to perform your duties with dedication and loyalty. The integrity, dedication for service and commitment to excellence that you foster during your career will define you. The officers in particular must remember that the commands you issue to your subordinates will not only determine their tasks but also impact their lives. You must therefore be very careful to give the correct orders at all times. All of you must also understand that with the end of the war, the responsibilities that will be vested with the Armed Services may go beyond what is customary. Because of the skills and knowledge imparted to you during your training, and the professionalism that you will develop during your service in the Air Force, you will be able to undertake different types of roles and responsibilities. Not long after the war, His Excellency the President appointed some of the Flag Rank Officers who were at the war front as Ambassadors and Deputy Ambassadors in different countries around the world. Many Officers were also posted as Defence Attach,s to important embassies. In these various capacities, they have all brought a great deal of credit to their respective Forces, and have done a great service to their country. Similarly, there are other fields in which Service personnel have had the opportunity to display their dedication, adaptability and professionalism in serving the country. Officers from all three services have become involved in undertaking development work. The quality of their work and their performance of duties in a professional and timely manner has greatly impressed everyone they have worked with. In fact, more and more authorities and agencies are requesting the secondment of military officers to their organisations. They wish to have the assistance of these officers in executing their tasks, because they know that the military can deliver high quality results. Many officers have therefore become involved in diverse fields that most people would not have thought likely even a few years ago. For example, the entire management of the newly built Mahinda Rajapaksa Nelum Pokuna Performing Arts Theatre comprises officers from the three Services. Though some sections of the arts and entertainment community had doubts about the ability of military personnel to undertake such work, even those who were critical are commending the exemplary work done by those officers today. This shows very clearly the value of the training and the skills that you receive during your service in the military, and how it enables you to adapt to the different demands of society and the country. In terms of national security, we must remember that even though the 30 year long war has ended, it is the primary duty of all military personnel to ensure the continued security and stability of our country. We must protect the peace that was achieved with great difficulty and great sacrifice. Although you will not be engaging in offensive operations, it is essential that the duties you perform in a passive role will prevent the regrouping of the terrorists and prevent the emergence of new threats. We know that there are remnants of the LTTE still operating outside Sri Lanka, and there are others even within Sri Lanka who may try to destabilise the peace. It is very important that we remain vigilant about such threats. We must ensure that peace and stability continues, enabling us to build a better future for all Sri Lankans. Since the end of the Humanitarian Operation, the Government has done a great deal of work to bring back peace and stability to Sri Lanka. Military personnel have been at the forefront of this effort as well. The difficult task of demining the North has been almost completed, and the military was given the responsibility for clearing the largest area of land. By the end of July, nearly 300,000 IDPs who were in Government care after the war have been resettled. Further, the Government has successfully reintegrated nearly 12,000 LTTE cadres who surrendered at the end of the Humanitarian Operation. Most of the LTTE cadres who were detained at various stages during the past several years have also been rehabilitated and released. With the resettlement of the civilians and the reintegration of former cadres, normalcy is returning to the North. The Government has undertaken major infrastructure development projects in the North and East. It has built up the road network, including the major A-9 and A-32 roads; it has expedited electrification, irrigation and projects to enhance availability of drinking water. Our Armed Forces have helped people rebuild their homes; the military has built schools and playgrounds for children; it has conducted health camps and medical clinics; it has provided assistance for the people to resume their livelihoods. This showcases the professionalism and dedication of our Armed Forces: after winning the war, they immediately set out to win the peace. His Excellency the President and the Government of Sri Lanka have always recognised the invaluable service of the military to this nation. A lot has been done to look after the interests of Armed Forces personnel. To look after those brave soldiers who were gravely disabled during the war, the Ministry of Defence together with the Sri Lanka Army has opened the Mihindu Seth Madura in Attidiya and the Abhimansala in Anuradhapura. The Ministry of Defence has also started a special network of schools for the children of Armed Forces personnel; in just six years since it was started, the Defence Services School at Malay Street in Colombo has gone on to become one of the best schools in the country. Further, the Ministry has also started a scholarship programme for the children of the Armed Forces who are in schools. The Welfare and Seva Wanitha Units of the Ministry of Defence and the Armed Forces are building houses for personnel who need such assistance. Under the Api Wenuwen Api programme, a large number of houses have already been constructed in all Districts and handed over to Armed Forces personnel. In recognition of the service of the brave soldiers who sacrificed their lives during the war, His Excellency the President awarded medals for gallantry, including the Parama Weera Vibhushana, the highest award given to Armed Forces personnel, at the Victory Day Parade. The Government has also recognised the sacrifices made by the families of such brave personnel, and medals have been awarded to the immediate family members. The parents of serving soldiers who fought from the start of the Humanitarian Operation to the end of the war will be given an allowance every month to recognise their dedication and contribution. The Government has also thought about the welfare of retiring soldiers, and has created a company under the Ministry of Defence called Rakna Arakshaka Lanka to employ them after retirement if they so wish. This gives them yet another opportunity to continue their service to the nation. 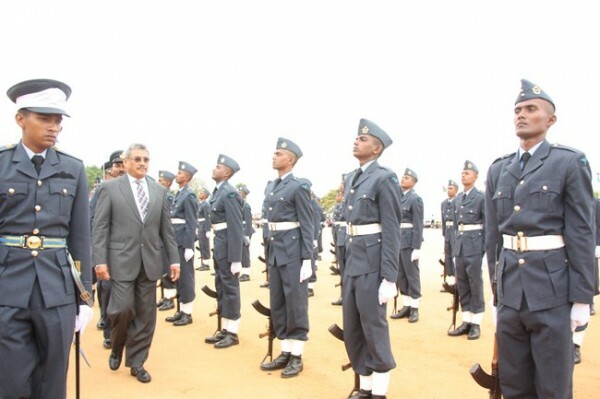 As the young officers and recruits of the Sri Lanka Air Force, all of you have long careers of service and dedication to your country ahead of you. This is a rare privilege, and I trust that you will make maximum use of this opportunity to discharge your tasks with enthusiasm, integrity, and courage. When you reflect on your careers, I hope you will be able to look back with pride at having achieved great things for your country. In closing, I once again take this opportunity to wish you every success.